We’d love your help. Let us know what’s wrong with this preview of Her Hope Discovered by Cynthia Herron. Is the sure thing worth risking for the possibility of maybe? Charla Winthrop, a savvy business woman seeking a permanent lifestyle change in small-town Ruby, learns that things aren’t always what they appear when she takes up residence in a house steeped in charm and a hint of mystery. Rumor has it that Sam Packard the town carpenter is her go-to guy for home remodeling, b Is the sure thing worth risking for the possibility of maybe? Rumor has it that Sam Packard the town carpenter is her go-to guy for home remodeling, but can Charla convince him to help her—with no strings attached, of course? Alone far too long, Sam’s prayed that God would send him a wife and a mother for his daughters. However, the new Ruby resident is hardly what he imagined. A new place to call “home,” the possibility of what might be, and the answer to someone’s prayers unite this unlikely pair with the help of the town’s residents. To ask other readers questions about Her Hope Discovered, please sign up. HER HOPE DISCOVERED is the first book I've read by Cynthia Herron. It is the first book of three in the Welcome to Ruby series. To be totally honest, I fell in love with the cover the minute I saw it. Cynthia has a way of grabbing her readers and she never lets us go. I was instantly hooked on all the characters and they felt like they were old friends by the end of the story. This is a story of second chances. I loved everything about this beautiful story and I'm excited to continue the series. HER HOPE DISCOVERED is a quick read and unputdownable! I found myself laughing one second and then tearing up the next. If you are looking for a beautiful story to pull you out of your book slump, you can’t go wrong with HER HOPE DISCOVERED. Cynthia Herron is now one of my auto buy authors. I can't wait to go back and visit my friends in Ruby, Missouri! HER HOPE DISCOVERED is a heart tugging story filled with guilt, loneliness, heartbreak, and love that will hold you hostage until the very last page. Once I started this heartwarming story, it was very hard to put down! I really prayed that Sam would be able to convince Charla that he is the man she is looking and hoping for. Oh, as a warning to the reader, keep the tissues handy and do not read the ending in a public place unless you don't mind crying in front of strangers! HER HOPE DISCOVERED is filled with twists and turns and had me staying up way too late one night to finish! I had to know where Cynthia Herron was taking us and what would happen to Charla. She is coming from a life of luxury and moves to a small town in the Ozarks. Can she survive? There is so much heart in Cynthia's writing that I was left with a huge smile on my face and my heart very happy. All of the characters are very interesting and believable, so much so that I felt as if I've known them for a long time. I can totally see HER HOPE DISCOVERED becoming a movie that I would love to watch. Oh, this story! Her Hope Discovered is like a warm embrace from a dear friend on a winter day. The author's gentle style and lovely writing carried me along on Charla and Sam's journey to Happily Ever After. It's not an easy ride though, and both hero and heroine carry considerable baggage that interrupts their relationship and (incredibly sweet) chemistry. Faith and Hope, Sam's daughters, are a delightful addition to the story, along with an amusing cast of characters from tiny, welcoming Ruby, Oh, this story! Her Hope Discovered is like a warm embrace from a dear friend on a winter day. The author's gentle style and lovely writing carried me along on Charla and Sam's journey to Happily Ever After. It's not an easy ride though, and both hero and heroine carry considerable baggage that interrupts their relationship and (incredibly sweet) chemistry. Faith and Hope, Sam's daughters, are a delightful addition to the story, along with an amusing cast of characters from tiny, welcoming Ruby, Missouri. The gorgeous descriptions of life in the Ozarks set me right onto the pages, and the supernatural thread that tied through the story added an emotional touch that made me tear up. Raised with wealth and privilege, Charla Winthrop has tried to live up to her prestigious last name. She quickly found that wealth did not equal peace, nor did business success relate to personal fulfillment. Having visited the Ozarks for a developmental project and being drawn to its charm, Charla decides to make a fresh start of her life. She lands in the charming small town of Ruby, Missouri, and quickly makes friends with the local citizens. Sam Packard lost his wife more than three years ago Raised with wealth and privilege, Charla Winthrop has tried to live up to her prestigious last name. She quickly found that wealth did not equal peace, nor did business success relate to personal fulfillment. Having visited the Ozarks for a developmental project and being drawn to its charm, Charla decides to make a fresh start of her life. She lands in the charming small town of Ruby, Missouri, and quickly makes friends with the local citizens. Sam Packard lost his wife more than three years ago and has begun praying that God would send someone who could share his life and help him raise his daughters. When he meets the lovely new stranger he wonders if she could be the answer to his prayer. Excited to discover new passions and get to know who she is apart from the things that have controlled her in the past, Charla eagerly embraces the new things and people in her life. Is it too soon to be attracted to helpful handyman Sam and his lovable little girls? Charla must navigate her budding dreams, the expectations of herself and others, and contentious family relationships in order to find out who she is supposed to be. I don't read a lot of contemporary romance, and while I enjoyed this story, I feel like true fans of the genre would be even more enchanted by it. I'm also not a fan of several of the tropes used within the plot, which isn't the book's fault at all. I do love small town stories, and this one was especially fun because I live in the Missouri Ozarks myself and get to experience the down home charm every day. It's a wonderful part of the country. I'd recommend this for everyone who loves cozy contemporary romance, and I look forward to more books as Herron's Welcome To Ruby series continues. Once in a while a story comes along that brings me joy, tears and a ton of hope and this is one of those special stories. From the first page, I felt close to the characters and enjoyed learning more about each one. Second chances at love, trust, faith and hope are all found for the people in this heartwarming story. I truly enjoyed this one. I received a complimentary copy of this book and this is my personal honest opinion. No review was required. I knew when I read the synopsis of this book that I absolutely had to read it. It's not often that I stumble across books set in my backyard. I mean Ruby doesn't really exist in my backyard, nor Jewel County but. . . I was born in the Ozarks. I was raised in the Ozarks. I still live in the Ozarks. , one of my high school rivals was the town of Ozark. This region of the country is truly like no other with the slower pace of the south but not truly southern. We have some mannerisms of the n I knew when I read the synopsis of this book that I absolutely had to read it. It's not often that I stumble across books set in my backyard. I mean Ruby doesn't really exist in my backyard, nor Jewel County but. . . I was born in the Ozarks. I was raised in the Ozarks. I still live in the Ozarks. , one of my high school rivals was the town of Ozark. This region of the country is truly like no other with the slower pace of the south but not truly southern. We have some mannerisms of the north without coming close to being Yankee. Once upon a time when this region was more isolated, due to the 'mountains' (I say with tongue in cheek as the Ozark Mountains are really gloried hills) and plateaus that truly did isolate, we had our own dialect and mannerisms. Think Appalachia but less intense in the hillbilly. It's hard to capture that history as it meets current reality without pandering to to stereotypes or missing the mark altogether. You have to experience it, steep yourself in it, to truly get it. At least my opinion.Cynthia has obviously lived it. You don't have to read her bio to know that she gets the lifestyle here. As much as I say this with all the love though it did fall short for me. I felt like I was told more about the landscape and the lifestyle than shown. I feel like there was a vibe that was just missing. I also felt a bit pandered to. For those of you that don't really know me I feel the need to preface this. I am about as hick-y, folksy as they come. I make it up as I go so to speak. If you have read any of my posts you've experience it a time or twenty. If you know me in real life you experience it constantly. I get folksy on so many levels. However, I felt like several characters in Ruby were more stereotypical than truly folksy. I feel like Herron tried just a bit too hard to capture the essence that is this part of the country while trying to contrast the difference of Charla's (I LOVE that name by the way) runaway Boston lifestyle. I don't know that someone without history here will get near the takeaway I did with this. Heck, I don't know that someone with history here will feel the same way.I'm gonna be honest, again, I got a little scared of insta-love for a minute. Sam fell a little too hard too fast but. . .He managed to slow his role and truly get to know Charla before deciding that forever after was in the future. I appreciated that so much. I did get a bit bogged down and an overwhelming desire to hand out a few Gibbs' smacks with Sam and Charla's inability to actually have a conversation at times instead of just making decisions in their heads. I loved the interplay of spiritualism with the faith the injection that God truly does interact and help to guide our lives. It's up to us to be open to where he is trying to guide us. For me it truly gave a spiritual angels vibe and not a mystical vibe. There is a difference, just sayin'. I appreciated the feel of community and healing. Sam's guilt and his relationship with Edwin, Charla's need to take a different path than what she was raised to be and even the relationship with her family. There was so much to love about Ruby that it is easy to overlook the things that didn't quite jive for me. I truly do recommend this book for anyone that needs a sweet love story or anyone who needs to be reminded that you can move forward no matter where you find yourself or what life throws your way. It's also a great book for anyone that needs to slow down for a minute and enjoy some time in my backyard. I can't wait to visit Ruby again! I was provided a complimentary copy of this book by Just Read. I was not compensated for this review and all thoughts and opinions expressed are my own. I was not required to write a positive review. Charla is a young woman who sold everything and moved out to a small town in Missouri to start her life over. She worked a demanding high level corporate job that drained her emotionally and physically, and was invested in a relationship with a man who didn’t want to commit for the long run. She also grew up in a wealthy family who’s mother was quite demanding and forthright. She left to get away and find herself again. And the last thing she wanted to do was get involved in another relationship. Charla is that woman you aspire to be - wealthy, successful, but also kind and considerate. Sam is a widow of three years with two little girls, Faith and Hope. He owns his own carpentry business and lives in the house next to Charla. His friend Horace believes it’s time for Sam to move on and start dating again. He things that Faith and Hope need a mom, especially at this point of their life. Speaking of Horace, he is that sweet old southern man that is filled with stories and wisdom. He was a good influence for Sam. Sam doesn’t know what to think about dating. He isn’t sure if he can let go of Angie, his former wife quite yet. Ruby just sounds like one of those small towns that you would never get tired of. It also reminds you of how slow paced and friendly small towns are. It just seems like the idyllic place to set up a vacation home and enjoy some iced tea on the porch. Cynthia definitely made me miss that small town feel I grew up in! I absolutely adored the charming town of Ruby. It felt like you stepped back in time when people actually talked to you at the grocery store line, people waved at you as you drive down the street, and the waitress at the diner was friendly and sweet instead of rushed. I feel like we need to experience that more often! Charla and Sam were so cute together. However, I do have one gripe. I thought they got together too quickly in my opinion. I think that there should have been more time lapse between Charla moving in the house and them getting together. Faith and Hope were so adorable - they were sweet on Charla right away. They always looked forward to her visits and I think Charla fell for them fast as well. Each character I think represents a certain life lesson. Charla has a second chance at life and has to let God help her see where that will lead her. Sam has to learn how to be honest (you have to read the story to understand) in relationships but also be more trusting in God. Charla’s mother has to learn how to appreciate life more and realize that family is everything. I think we all go through these life lessons one point in our lives and that makes this book quite relatable. Though this story was kind of predictable I thoroughly enjoyed this story and the characters. I also could see this being adapted into a Hallmark movie! This story would be perfect for that channel. Yes most definitely. I think this book would be perfect to read on the back porch with some sweet iced tea. It’s one of those feel good books you will just adore! Reading Her Hope Discovered is like sitting down at the fireside with a good friend and your favorite hot beverage for a cozy chat. The writing is fantastic and very interesting. It is compelling and creative with beautiful descriptions appropriately sprinkled throughout the story. It is so easy to visualize the beauty of the Ozarks as you read. I was so quickly invested in the characters, caring deeply what happened to them. And not just Charla and Sam, the main characters, each of the people in Reading Her Hope Discovered is like sitting down at the fireside with a good friend and your favorite hot beverage for a cozy chat. The writing is fantastic and very interesting. It is compelling and creative with beautiful descriptions appropriately sprinkled throughout the story. It is so easy to visualize the beauty of the Ozarks as you read. I was so quickly invested in the characters, caring deeply what happened to them. And not just Charla and Sam, the main characters, each of the people in the town of Ruby became friends I want to know more about. It almost makes me want to pack up and move to a small town. . . Almost! Sam is a widower who has two adorable little girls full of life and energy. The great love he has for them is so touching. Despite his strong faith, he struggles with guilt over the argument he had with his wife the last time he saw her and feels responsible for her death. His inability to accept forgiveness for this has alienated him from at least one person he needs in his life and that of his daughters. This hard-working man has a heart of gold, though he is not without his flaws. Charla is a newcomer to the Ozarks, having moved to Ruby from a suburb of Boston – fleeing from the hectic life that was consuming her. She has dreams of being independent and having a chance to actually live her life making choices that are not designed to please others, especially her mother. Her heart is quickly captivated by the handsome carpenter and his precocious daughters, though she is afraid to trust it to anyone. The fun colloquialisms used and the quaint speech of the “locals” are not overdone. They are mixed in at a very appropriate pace to give a sense of place to the story but not overwhelm. Through a fair amount of the story is a hint of supernatural activity that had me a little concerned. Because this is a debut novel by an author I don’t know personally, I was a little concerned that the theology was going to be “off”. I was so pleased to find out that concern was unwarranted. Her Hope Discovered is a lovely story of faith, hope, love, and forgiveness. It is a fantastic debut novel – not because it is a debut novel – it is fantastic by any standard. I loved this heart-tugging romance about a couple working toward happiness with help from a town full of friends! Her Hope Discovered is a heart-touching emotional journey as two people come to grips with the past...one with the pain of guilt and one with the of pain of rejection. Her Hope Discovered, by award-winning debut author Cynthia Herron, finds big city gal Charla Winthrop arriving in small town Ruby, Missouri. She is leaving her lucrative job and privileged life in Boston to find what she I loved this heart-tugging romance about a couple working toward happiness with help from a town full of friends! Her Hope Discovered, by award-winning debut author Cynthia Herron, finds big city gal Charla Winthrop arriving in small town Ruby, Missouri. She is leaving her lucrative job and privileged life in Boston to find what she truly wants in her life. As a symbol of her new independence, she purchases a charming old home and begins to fill the intriguing rooms with her personality. Widowed carpenter Sam Packard has his hands full with raising two cute little girls and dealing with a devastating sense of guilt. His big heart has multiple issues to work through before he can convince Charla he is the man she is hoping for. Fortunately he has his dear friends and the good Lord to help him along the path to happiness. I completely enjoyed my visit to Ruby, Missouri, an Ozark town filled with the warmth of folks supporting each other through the good and bad times....true friendships! The characters are real, the feelings are touching, and the romance is sweet. Author Cynthia Herron knows how to delve into the thought process of her characters....sometimes dealing with raw hurts and sometimes consumed by indecision....to bring us an emotional, feel-good story with a deeply satisfying ending. I liked the mentions of God-inspired moments, plus the wise nuggets of down-to-earth wisdoms, sprinkled throughout the pages. The images are vibrant, and there are foodie delights...my cup of tea....such as the Come And Get It Diner, celebratory feasts, and chocolate chip cookies! I’m already anticipating more visits to charming Ruby, Missouri. I want to know what happens in the lives of the lovable folks of this warm little village...just as with true friendships. If you like to be engaged with characters as they find hope and happiness, you will definitely enjoy Her Hope Discovered. This was one the most heartwarming book I have ever read, I absolutely loved it. Once I started reading it I could not put it down, I sat in the same spot all day completely entranced by the story. The writing flowed nicely and kept me intrigued. I especially loved how the surroundings were described, the Ozarks sounded like a magical place. All of the characters were so perfect, they felt real and had so much depth. I really liked the small town feel, everyone knew each other and they were all This was one the most heartwarming book I have ever read, I absolutely loved it. Once I started reading it I could not put it down, I sat in the same spot all day completely entranced by the story. The writing flowed nicely and kept me intrigued. I especially loved how the surroundings were described, the Ozarks sounded like a magical place. All of the characters were so perfect, they felt real and had so much depth. I really liked the small town feel, everyone knew each other and they were all very welcoming to the arrival of a new resident. Charla, of course was my favorite. I really admired her drive to start a new life away from everything she knew. She was so brave and strong taking initiative and doing what was best for her. The life she was living was lacking the main thing any good life needs, love. Instead of just settling for what she had, she went to start a life worth living and found so much more than she could have ever envisioned. Sam, was such a good man battling his own demons. It saddened me how he had ancient views of women's roles in the household, but it was only because he really just treasured family above everything and wanted to take care of his family; which I can totally relate to. He was so sweet and caring and I just loved his relationship with his girls, it was so precious. Overall this was an incredible read I can't recommend it enough to everyone I know. It had heartache, hope, and above all love. If your looking for something to lift your spirits and just put you in a feel good mood this is the book for you. I can not wait to read the rest of the books in this series, if they are anything like this one I know I'll be in for a treat. Charla is determined to make her dreams a success but to the detriment of what? On the day that she drives into town she's faced with a flat tire. Little did she know that this would set off a chain I loved this book! On the day that she drives into town she's faced with a flat tire. Little did she know that this would set off a chain of events to rock her world. When her new neighbor Sam stops to help her she can't deny the initial attraction. And we can't begin to overlook the new house. It's huge and gorgeous and smells like chocolate chip cookies. She can't quite be sure why she gets that smell in her nose or has a dream about two gorgeous little girls but time will reveal. All the intertwined paths come together in the end, but it's the journey of healing and trust to get there that keeps the reader spellbound. There are no suspenseful chew on your fingernails times but there is a lot of must keep reading to find out what happens next moments. I give this book a great thumbs up and am looking forward to the next book in the series with anticipation. I'm glad I've found yet another author to follow. Her Hope Discovered is a contemporary romance novel by author Cynthia Herron. It is book one in the “Welcome to Ruby” series. Charla Winthrope is new to Ruby, Missouri and Sam Packard is a hunk of a single man, living in Ruby. After Edwin’s, secondary character, wife died he wanted to die. Then he started seeing signs of hope: a rose bush blooming in the middle of a Missouri winter, misplaced car keys suddenly appearing where he first looked, the scent of chocolate chip cookies lingering in the h Her Hope Discovered is a contemporary romance novel by author Cynthia Herron. It is book one in the “Welcome to Ruby” series. Charla Winthrope is new to Ruby, Missouri and Sam Packard is a hunk of a single man, living in Ruby. After Edwin’s, secondary character, wife died he wanted to die. Then he started seeing signs of hope: a rose bush blooming in the middle of a Missouri winter, misplaced car keys suddenly appearing where he first looked, the scent of chocolate chip cookies lingering in the house though none had been freshly baked, and Scriptures earmarked in the Family Bible. He sold the house to Charla because it showed signs of hope. With lots of rooms and nooks and crannies, this is a house I would enjoy exploring. Steeped in romance this is a great book for readers who enjoy contemporary romance novels. This is also a great book on forgiveness, reconciliation, and new beginnings. I look forward to reading book two of this series. When Charla decides to leave her busy, meaningless life in Boston and move to the small town of Ruby, Missouri she is looking forward to the change of pace and to beginning the journey to figuring out what she truly wants in life. While she's planning there are other that are praying for her to come into their lives. Sam and his young daughters, Faith and Hope, have been hoping for someone to fill the void that was left when their wife and mother died in an accident three years ago. Could the new When Charla decides to leave her busy, meaningless life in Boston and move to the small town of Ruby, Missouri she is looking forward to the change of pace and to beginning the journey to figuring out what she truly wants in life. While she's planning there are other that are praying for her to come into their lives. Sam and his young daughters, Faith and Hope, have been hoping for someone to fill the void that was left when their wife and mother died in an accident three years ago. Could the new Bostonian in town be the answer to that prayer? Charla's presence in Ruby is going to be a game changer in more ways than one and usher a time of self discovery, truthfulness, and forgiveness in multiple lives. From the beginning I was completely and utterly charmed by Her Hope Discovered. From the Mayberry-esque town and all its charismatic array of characters to the breathtaking descriptions of Ruby and the surrounding Ozarks, you feel yourself transported to this wonderful and charming place with every page. Though sweet, and mostly predictable, there is just enough subtle conflict to keep it interesting until the end, and the theme of love and forgiveness that flows throughout leaves you all warm and fuzzy. Very sweet story! Welcome to Ruby, Missouri! Her Hope Discovered is the debut novel of author Cynthia Herron, and it is a beautiful introduction. Her Hope Discovered is full of faith, love, and small-town charm. This contemporary romance will introduce you to some interesting and bigger-than-life characters, a place where people care about each other, and a home where the faith in a heavenly father makes the most extraordinary things happen. Her Hope Discovered is a wonderful picture of God’s divine intervention Welcome to Ruby, Missouri! Her Hope Discovered is the debut novel of author Cynthia Herron, and it is a beautiful introduction. 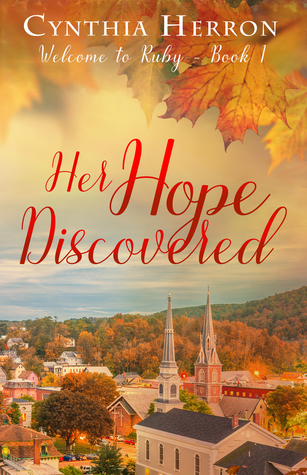 Her Hope Discovered is full of faith, love, and small-town charm. This contemporary romance will introduce you to some interesting and bigger-than-life characters, a place where people care about each other, and a home where the faith in a heavenly father makes the most extraordinary things happen. Her Hope Discovered is a wonderful picture of God’s divine intervention in our lives. I do believe that God can and will lead our paths to intersect with people at just the right time. I do believe He answers prayers in ways we never expected, just because He can, and He loves to show His children that He loves them. I believe in divine appointments and God’s hand working in our everyday life, but elements of this story bordered on the paranormal which I found uncomfortable and odd. I enjoyed how much the characters’ faith in God played a big part in the story. The spiritual elements were not subtle, and I enjoy that in a Christian novel. These characters are unforgettable, the town of Ruby is a place you’ll want to visit again and again. I recommend this book for lovers of clean, faith-based romances. I received a copy of this book from the author. A positive review was not required. All thoughts and opinions are my own. Her Hope Discovered by Cynthia Herron is the first in the Welcome to Ruby series. Ruby, a small town in the Missouri Ozarks, is quite Mayberry-ish; no one is a stranger, even newcomer Charla Winthrop a high-powered executive looking for something different, less demanding with a slower pace. She finds it in Ruby but is she truly prepared for the change from the seeming anonymity of the big city to the everybody in town knows which house she bought? It seems all the townsfolk know her activities Her Hope Discovered by Cynthia Herron is the first in the Welcome to Ruby series. Ruby, a small town in the Missouri Ozarks, is quite Mayberry-ish; no one is a stranger, even newcomer Charla Winthrop a high-powered executive looking for something different, less demanding with a slower pace. She finds it in Ruby but is she truly prepared for the change from the seeming anonymity of the big city to the everybody in town knows which house she bought? It seems all the townsfolk know her activities almost before she does! Charla is accepted, loved and supported from the minute she moves into her knew too big for her home. Hiring Sam Packard to complete some carpentry work soon finds Charla faced with a dilemma. He captures her heart far too quickly and despite her efforts, Charla finds herself completely falling for Sam. When she meets his two young and adorable daughters Charla is totally charmed. Despite what her heart is doing, Charla resists the effect the handsome carpenter; she just ended a two year relationship with a very controlling man. Charla just wants to step back, figure out who she is and follow her dreams. Her Hope Discovered is a delightful romance. Charla and Sam were clearly destined to be together, but I enjoyed reading how they got to that point. Herron also provides wonderfully written secondary characters that I grew to love. Edwin was absolutely my favorite. He was a wealth of knowledge, inspirational, and also looking out for the best interest of his son-in-law. He was so sweet, and I found myself looking forward to his scenes the most. In addition, Sam's daughters were so cute and sweet. Her Hope Discovered is a delightful romance. Charla and Sam were clearly destined to be together, but I enjoyed reading how they got to that point. Herron also provides wonderfully written secondary characters that I grew to love. Edwin was absolutely my favorite. He was a wealth of knowledge, inspirational, and also looking out for the best interest of his son-in-law. He was so sweet, and I found myself looking forward to his scenes the most. In addition, Sam's daughters were so cute and sweet. They absolutely stole the show when they were in the scene. I enjoyed the way they immediately took to Charla, even though I assumed they would to make the story go smoother. But Herron easily pulls you in, not only to the story line and the characters, but to the entire community. Time and time again you hear Charla say how wonderful she thought Ruby was, and I have to admit that I felt the same way. It's that sweet town where everyone is friendly and you just want to stay there forever. Feels like home. I enjoy stories like that! The debut novel by Cynthia Herron was fantastic! Her Hope Discovered is indeed a story of hope. Add to that romance, forgiveness and redemption all rolled into the picturesque town of Ruby. I want to live there. Ms. Herron understands, and paints for us within the pages a beautiful and realistic picture of life in a small town and the all-important sense of community and support that is synonymous with small-town living. Her characters go deep, each with their own imperfections, flaws and baggag The debut novel by Cynthia Herron was fantastic! Her Hope Discovered is indeed a story of hope. Add to that romance, forgiveness and redemption all rolled into the picturesque town of Ruby. I want to live there. Ms. Herron understands, and paints for us within the pages a beautiful and realistic picture of life in a small town and the all-important sense of community and support that is synonymous with small-town living. Her characters go deep, each with their own imperfections, flaws and baggage from their past that invite us to make them our friends and learn from their choices, wise or otherwise. Charla moves to the small town to escape her corporate job in the city and her overbearing mother. Sam, single father of two daughters since his wife passed three years ago, is intrigued by Charla, but her can't get past all the obstacles in his heart. Can Charla make a home for herself, perhaps even find love in Ruby despite the heart-battles she faces with her mother and ex-boyfriend? Can Sam let go of the past long enough to allow hope for the future into his life? Can love really be strong enough to find forgiveness when it matters most? I was drawn into this book from the opening paragraph with the description of the Missouri region of the Ozarks. The Ozarks are home to me, and the author did an excellent job describing the natural beauty of this region of the country. She also completely understands the close relationships among the residents of a small Missouri town. But even more than her description of the beautiful countryside, this book’s characters will steal your heart. Charla, Sam, Faith and Hope were meant to come toge I was drawn into this book from the opening paragraph with the description of the Missouri region of the Ozarks. The Ozarks are home to me, and the author did an excellent job describing the natural beauty of this region of the country. She also completely understands the close relationships among the residents of a small Missouri town. But even more than her description of the beautiful countryside, this book’s characters will steal your heart. Charla, Sam, Faith and Hope were meant to come together to form a family, and their story is a lovely one to read. Sam and Charla have each come through great heartache and are ready for a new start in life, but each have deal with a issues of trust to get there. Their road to romance is not always smooth, and they face the challenge of reconciling their differences of viewpoint to form a happy marriage. There’s a very strong emphasis of faith of how God works in our lives through circumstances that we might not understand or recognize at the time. There’s a little bit of “heavenly intervention” throughout the book, and the way the whole story pulls together is very satisfying. I enjoyed reading this book and look forward to reading more about the residents of Ruby, Missouri. I really enjoy visiting Small US towns and reading about Small Quaint towns. Quaint towns have a peaceful feeling about them, no rushing through life. Her Hope Discovered is based in a Quaint town and I feel in love with the book from the start. The main character, Charla, moves to a small town in the Ozarks, Ruby, to get away from the life of being busy constantly and to truly find herself and her passions. Charla quickly learns God may have different plans for her and those plans include a wid I really enjoy visiting Small US towns and reading about Small Quaint towns. Quaint towns have a peaceful feeling about them, no rushing through life. Her Hope Discovered is based in a Quaint town and I feel in love with the book from the start. The main character, Charla, moves to a small town in the Ozarks, Ruby, to get away from the life of being busy constantly and to truly find herself and her passions. Charla quickly learns God may have different plans for her and those plans include a widower Sam and his 2 daughters. Both Sam and Charla have "baggage" from the past, but look to overcome those challenges to form a relationship and find happiness with each other. Her Hope Discovered is a book of Second Chances, Forgiveness, and Moving On. It is Book 1 in the Welcome to Ruby series for debut author Cynthia Herron. Cynthia really "knocked it out of the park" with her Debut book! I am very much looking forward to reading the entire series! When Charla Winthrop decides to make a drastic change in her life, she moves halfway across the country to small town Missouri and immediately meets Sam Packard, single father and local carpenter. From there, their relationship progresses quickly, and they envision a picture-perfect future together. As all good love stories go, there arises complications that threaten their newfound joy. While I won’t spoil the surprise, I must say that I applaud Cynthia Herron for addressing a somewhat hot topi When Charla Winthrop decides to make a drastic change in her life, she moves halfway across the country to small town Missouri and immediately meets Sam Packard, single father and local carpenter. From there, their relationship progresses quickly, and they envision a picture-perfect future together. As all good love stories go, there arises complications that threaten their newfound joy. While I won’t spoil the surprise, I must say that I applaud Cynthia Herron for addressing a somewhat hot topic for some families. However, I feel like the story is somewhat repetitive and a little hard to believe even for someone with a Christian background. There are also many instances where the obvious is stated, and I prefer a story that shows me the characters’ feelings and motives instead of spelling it out. Still, with its cozy Ozark small town setting and scenes that take place during the holidays, this book reminds me of the TV holiday movies that we all love! When Charla Winthrop makes some changes in her life, they are BIG ones. Leaving behind a prestigious career, a mother intent on keeping up appearances, and a controlling ex, Charla leaves Boston for the slower paced Ozarks. The move allows her freedom to stretch wings that had been clipped for too long, and the last thing she expects is an almost instantaneous attraction to a man. In Her Hope Discovered, Cynthia Herron gives readers a story heralding the simpler life of small town living. Sam and Charla are open about their attraction, and her subsequent hesitation to jump into another relationship, from the start. Conversation between them ranges from comfortable to intentional to emotional but all of it has a natural flow. And though predictable, this sweet story gives readers a look into real life issues—grief, pain, healing, independence, friendship—while shining the light on promises of second chances. Welcome to a heartwarming story of love, trust, and enduring relationships. This book will make you smile and cry, but will also give you the warm fuzzies! A delightful read – I quickly fell in love with Charla, Sam and his two adorable daughters, Sam’s best bud Horace, Ida Mae and her café, and even Charla’s controlling mother the widow Winthrop. Charla is determined to get a fresh start from her hub-bub of a life in Boston and moves to the quiet town of Ruby, where she feels instantly at home. Welcome to a heartwarming story of love, trust, and enduring relationships. This book will make you smile and cry, but will also give you the warm fuzzies! A delightful read – I quickly fell in love with Charla, Sam and his two adorable daughters, Sam’s best bud Horace, Ida Mae and her café, and even Charla’s controlling mother the widow Winthrop. Charla is determined to get a fresh start from her hub-bub of a life in Boston and moves to the quiet town of Ruby, where she feels instantly at home. Thinking that she just wants her independence, she quickly learns that God has other plans for her. The odd times she smells the aroma of chocolate chips baking, a soft hand on her face smelling of lilac, show her that a power stronger than her is at work in her life. God is a God of second chances. Cynthia Herron has written a sweet novel I found to be a delightful read. Not ooey-gooey, but fun and nicely laced with the message of God’s love. I can’t wait for the sequel! I received a complimentary copy of this book from the publisher and was under no obligation to post a review. With the impressive debut of Her Hope Discovered, Cynthia Herron establishes herself as an author to watch and this story is destined to become one of my favorites. The writing is solid, dialogue flows easily, characters are well developed, and the setting envelopes you in its arms. There’s even a touch of the supernatural that I found delightful. The beautiful Ozark Mountain town of Ruby embodies all that I love about small towns – people know and care about each other, friendships and faith are With the impressive debut of Her Hope Discovered, Cynthia Herron establishes herself as an author to watch and this story is destined to become one of my favorites. The writing is solid, dialogue flows easily, characters are well developed, and the setting envelopes you in its arms. There’s even a touch of the supernatural that I found delightful. I loved Sam and Charla from the moment I met them. Sam’s daughters are scene stealers, and his father-in-law, Edwin, is a wonderfully endearing character that I hope to see more of in future stories. Sam and Charla have some emotional baggage from the past and career-related issues to work through, but they are surrounded by a warm, supportive community, and the God of second chances is clearly seen. Through Edwin’s faith and prayers, one of my favorite spiritual themes shines brightly, and that’s the idea of God’s divine appointments. Sometimes I think we fail to see these opportunities personally, but Her Hope Discovered reminds that if we just think about it, we’ll see people and situations that God has orchestrated in our lives. I’m glad more Ruby stories are to come because I didn’t want to let go of these characters. If you’re looking for an uplifting and heartfelt read, this book is for you! Each of the characters felt so real, fro If you’re looking for an uplifting and heartfelt read, this book is for you! Each of the characters felt so real, from the moment I met them and instantly loved them. The dialogue flowed so naturally, drawing me right in. You’ll want to climb inside the story world and stay awhile. I know I did. Charla and Sam became friends I longed to see set free of their fears and regrets. Her Hope Discovered is such a lovely debut. Its pages offer much grace, joy and hope for readers. In the beginning, I felt it was going to be a sweet blossoming romance in a small town. The atmosphere and world building were pretty good, but I wasn’t impressed or in love with the characters. I enjoyed Ida Mae and the little girls most which were side characters to the two main. I didn’t feel like there was any growth or change in the characters until the very end of the book which the setting was supposed to span several months. I also found it to be repetitive, I don’t think I will continue In the beginning, I felt it was going to be a sweet blossoming romance in a small town. The atmosphere and world building were pretty good, but I wasn’t impressed or in love with the characters. I enjoyed Ida Mae and the little girls most which were side characters to the two main. I didn’t feel like there was any growth or change in the characters until the very end of the book which the setting was supposed to span several months. I also found it to be repetitive, I don’t think I will continue on this series. This was as sweet story in a nice town. It definitely had that small town feel to it. People are dealing with their heart ache from the past and trying to have a fresh start. I had trouble feeling the age of our main characters. They “sounded” older then I think they really were and I couldn’t get past that in my brain. It made it hard for me to fully connect with this book. For me this wasn’t a book I loved but it was sweet, just not for me. A copy of this book was given to me through the JustRead This was as sweet story in a nice town. It definitely had that small town feel to it. People are dealing with their heart ache from the past and trying to have a fresh start. This is the first book I've read by this author and I really enjoyed it. Charla has given up her 6 figure job in Boston and moved to Ruby, Missouri to start a new simpler life. She's bought a house she that felt like home when she first saw it. And then her life gets complicated when she meets Sam and his two daughters and falls in love with them. A great book about second chances and being where God places her. Sweet debut novel on the theme of second chances. An odd supernatural element doesn't seem to quite fit in a Christian novel, and there were more than a few "do people really talk like that?" moment, but I enjoyed the story of a young female exec who abandoned her career to relocate in a small town, only to meet the widower with two young children whose deceased wife grew up in the house Charla just bought. As a small town girl who has lived in the big city, it's quite a different pace of life. The author does a fantastic job describing the slower paced life that some people live in the country. From a neighbor helping to change a flat tire to feeding a stranger, this book takes you back to the country charm of small community living. Grace and second chances are interwoven through outthis novel, highlighting that we all need second chances, & God is a God of second chances. Cynthia writes Heartfelt, Homespun Fiction from the beautiful Ozark Mountains. A hopeless romantic at heart, she enjoys penning stories about ordinary people facing extraordinary circumstances. Her Hope Discovered, her début novel and the first in a three-book series, released December 2018 with Mountain Brook Ink. “Cindy” has a degree in psychology and a background in social work. She is a member Cynthia writes Heartfelt, Homespun Fiction from the beautiful Ozark Mountains. A hopeless romantic at heart, she enjoys penning stories about ordinary people facing extraordinary circumstances. Her Hope Discovered, her début novel and the first in a three-book series, released December 2018 with Mountain Brook Ink. “Cindy” has a degree in psychology and a background in social work. She is a member of ACFW, ACFW MozArks, and RWA. She is a 2017 ACFW Genesis Finalist, a 2016 ACFW Genesis (Double) Finalist, and a 2015 ACFW First Impressions Winner. Her work is represented by Sarah Freese at WordServe Literary. Besides writing, Cindy enjoys spending time with family and friends. She has a fondness for gingerbread men, miniature teapots, and all things apple. She also adores a great cup of coffee and she never met a sticky note she didn’t like. Cindy loves to connect with friends at her online home. She also hangs out on Twitter, Facebook, Pinterest, and Instagram. Sign up for Cindy’s monthly e-NEWSLETTERS.